Mark Watney is stuck on Mars. His mission was supposed to last only about a month, but after only a few days he and his team were caught by a particularly vicious dust storm, which risked tipping over and breaking their exit vehicle. And as if aborting the mission wasn't bad enough, disaster struck during the evacuation, when Mark was struck by flying debris. For very good reasons, his teammates thought he was dead. After wasting some precious time searching for him, they had to leave anyway. And then Mark woke up, alone in Mars. Through log entries, the book follows Mark as he fights to stay alive, searching for creative solutions in a situation where fatal disaster lurks in every corner. We also follow the people working on Earth in mission control and his former crew, as they all do whatever they can to bring him back. The Martian is fantastic. It's an incredibly tense and gripping story. I must say, I was afraid it wasn't going to be so at first. I wasn't particularly enthralled for the first few chapters, where it's basically Mark working his way through a number of different problems, in quite a lot of technical detail. It was all interesting enough, in its own way, but lacking narrative drive. Well, if you do decide to try this, do stick with it through the first bit, because once you get to the first chapter set in Earth, things really get going, and how! It's fascinating to see all the characters, but most of all Mark, working through the huge number of problems Mark's situation brings up. It all boils down to how Mark can be kept alive long enough to be rescued, but there are so many aspects to this, and that's not even considering what he might need to do if things go wrong. Which they do, in all sorts of ways. I loved seeing the sort of lateral thinking this required. There was a fair bit of technical detail here, all of which made sense to me, but then again, I'm not an expert. I did think the detail was sometimes a bit too much, but that might be because I was listening to the audiobook, and so listening to every word (including, at one point, to a readout of a computer log as it went through a reboot procedure). You can probably sort of glance quickly over this sort of thing when you're looking at the text. So that was great, but what really made the book for me were the characters, especially Mark. He's a fabulous narrator. As I mentioned earlier, we get his point of view through log entries. That may not sound too promising, but his personality and humour really shine through, as does his fear when things aren't looking good. But mostly, it's the humour. Mark is a bit of a clown (or rather, as the mission psychologists would put it, he's the type of guy whose reaction to extreme stress is to crack jokes), and this makes it really entertaining to be in his point of view. I loved the other characters as well. It's interesting, because we only see them at work and the way they react to the developments in Mars is really the only aspect of their personality we're witness to. And yet I got a really good sense of who all these people were. I particularly loved Mark's crewmates and the team dynamics, and really appreciated that the mission commander was female and that wasn't an issue at all. The one thing I thought was lacking in The Martian was any but the shallowest discussion of the ethics of spending that much money on saving one particular man. It's brought up very briefly and discounted with what I thought was a bit of a sleight of hand (and a copout, I'm afraid). There's a feeling that because a life is at stake, it's just not right to even consider the costs. Well, I'm quite impatient with that sort of stance. It's a cop-out. Maybe it's because I work in health economics and public policy and I'm therefore more comfortable than most with thinking about people's lives and health in the context of finite resources, combined with an almost infinite number of options to use those resources. I would probably have been a villain in this book, going "Hang on, can we think about this?" Still, I finished this with a happy sigh. AUDIOBOOK NOTES: The reader is really, really good. I was, however, not completely convinced by the decision to have him read the entire text. Mark's logs are, obviously, in the first person, so it's quite disconcerting to have the voice which in my head is Mark, reading the other third person sections, whether telling what's going on on Earth or giving us an omniscient update of what's going on with bits of equipment. Oh, how I loved this book and it's all down to Mark. Even my non-reading husband enjoyed it and because he's a science guy, I expected him to object to any number of things. But he didn't and we talked about all of it at length. I thought there was discussion about the ethics of cost, but maybe I'm conflating that with the risk to the crew in a rescue attempt. There was quite a lot of tension, IIRC, and I wasn't certain which way things would fall. 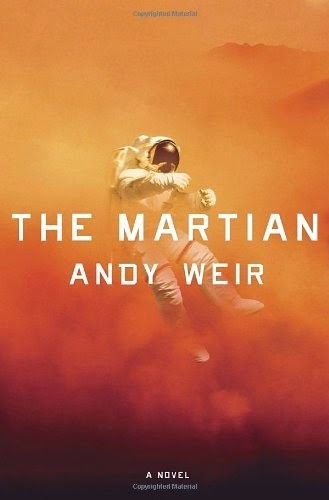 In any event, THE MARTIAN is one of my favorite books this year and I'm hoping for a sequel. Oh good, now instead of writing a review I can just say "What Rosario said." I just finished listening to this. I really enjoyed it but about 2 hours from the end I got frustrated. The pacing became very predictable and you'd just know that anything mentioned in any detail was the origin of the next problem. Almost without exception, if someone said "As long as totally unlikely X doesn't happen, we're fine," totally unlikely X would happen. This was the point at which your PS came into play for me. A lot of big issues were glanced at--the monetary value of a life, teamwork vs. isolation, whether a crisis like this can bridge political differences, self-sacrifice, risk vs. safety, etc. But they weren't really developed. OK, I don't think Weir meant to write that kind of book, and there's nothing wrong with a ripping good yarn. But since it didn't go to any of those places, I found by the end I'd lost some interest. If I'd been reading rather than listening, I would have started skimming. My eyes got moist a few times at the end, yes--but some of those tears were frustration. Darlynne: I did wonder what professionals in the area would think of the science, but really, it's not something that would have affected my enjoyment. It was believable to me. Re: the ethics of the cost, yeah, the discussion was all about levels of risk vs magnitude of the potential consequences. I was thinking more in terms of "these are other ways in which this money could be used." Liz: Thinking back, you're right about that. I was still carried forward by the tension, but whereas the problems that arose during the first two thirds or so of the book came as huge surprises to me, I could see the ones nearer the end coming. And that's very true, the ethics of the expense is not the only potentially fascinating issue that was glossed over. Much as I enjoyed this book, I'd love to read one that actually delved into them. Agree! I listened to the audio version of this one as well. All the techno babble sometimes got a little overwhelming. If I was reading this I def would've just skimmed those parts. Also, I read that this was a "re-imagined" ending, so I'm thinking that part where Weir is having Mark justify all the resources that were used to save him was a reaction to criticism. Also, I've heard rumors that they're trying to turn this into a movie and that Matt Damon is up to play Mark. Not sure how I feel about that. I don't think his brand of humor is snarky enough. I sort of pictured someone like Ryan Reynolds but not as pretty. Samantha: Oh, was it? Now I really want to know what the original ending was! I wouldn't be at all surprised if they did do a movie, but they'll have a bit of a job with a main character who doesn't speak at all! No kidding! I'm willing to bet that if they make into a movie they'll have Mark's daily logs be voice recordings so they can do voice overs as he goes about his business. And yeah, I'm really curious about what the original ending was as well.